What Does A Boat Captain Do? A boat captain is responsible for every aspect of boating including cleaning and maintaining the boat and safely transporting people and/or cargo. 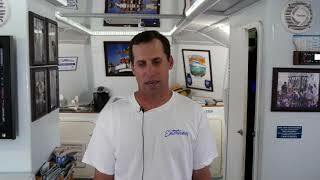 Videos on this page include one captain who takes tourists out for dolphin and sunset cruises and another one who takes fishermen out on fishing charters. A license or certificate is needed to be a boat captain. This may require that one attend school and have a certain amount of previous experience on a boat. What is the Average Salary For A Boat Captain? What Courses Should I Take To Become A Boat Captain? What Is The Work Environment For A Boat Captain? Boat captains work on boats. 🙂 At times this may require working in bad weather. Also, as Ben mentions in the video, at times he has to clean up the boat after seasick tourists get sick! What Is The Future Outlook For A Boat Captain? There is likely a lot of competition for this type of a boat captain because it is seasonal and only available in certain areas.